Haruka Fukusumi: Nocturne in c minor, Op. Posth. Leighton Ko: Nocturne in c Sharp minor, Op. Posth. Leo Yoshida: Waltz in e minor, Op. Posth. Tristen Chen: Nouvelles Etude in f minor, Op. Posth. Wilson Chen, 10-year-old, is currently a student at San Francisco Conservatory of Music. He started to play piano at age of five. Wilson loves classic music very much, especially Chopin, Mozart and Bach. Besides piano, Wilson is also playing violin. Tristen Chen started piano lessons at the age of five with Mrs. Nagisa Ariza. He has performed solo, piano duet and piano trio pieces in several concert venues including the Weill Recital Hall in Carnegie Hall. In 2017, Tristen starred in a film by the Everybody Is A Star Foundation. He was also invited to perform solo piano at the Open Ceremony of the 21st Annual Sonoma International Film Festival in March 2018. He won the second place at the American Protege International Piano and Strings Competition in 2018, and recently performed at their Winners Recital at Carnegie Hall. Tristen also likes to compose his own music. In 2016, his school's classmates all sang a Christmas song that Tristen composed when he was 7 years old, at the Ramblewood Elementary School annual Christmas Performance. Besides music, he enjoys swimming and speaking French. Anna Guan (14) 9th grader from California. She has been studying piano with Ms. Liza Yasnogorodsky since April, 2009. Anna has been selected to perform at various festivals and concerts sponsored by CHOPINSF, MTACSF, EBMF, and American Protege. Anna has won numerous awards including second place in the American Protege International Piano and Strings Competition, second place in the Chopin Competition of San Francisco, second place in the Showcase Piano Solo in the USOMC, and first place in the MTACSF Competition. In her spare time, Anna enjoys reading and watching Marvel and DC movies. Haruka Fukusumi, age 8, is a 3rd grader at Meyerholz Elementary School in Cupertino. She has been studying piano since 6 when she was in Japan and she moved to the U.S.A. in summer of 2017 due to her father's business. Her current teacher is Nagisa Ariza. Haruka performed at a series of regional competitions in Japan and won a number of awards during the first two years of her career as young pianist. In December 2016, she won special recognition award at regional competition of 7th Japan J.S. Bach Music Concours. In January 2017, she was awarded encouragement prize at final stage of 18th Chopin International Piano Competition in ASIA. Haruka is taking classic ballet training at a ballet school in San Jose. She also likes singing, drawing and playing with her puppy. Catherine Jian (7) is a 2nd grader at Challenger School. She started her piano lesson at age 5, and her current teacher is Lena Grozman. She won 2nd place at USOMC Showcase Solo, in 2018. Besides playing piano, she loves ballet, ice-skating and reading. 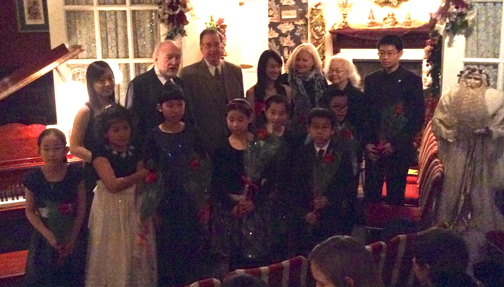 Leighton Ko, age 8, is currently studying piano under Marilyn Thompson. Leighton won first place in the 2016 Little Mozarts Competition and was invited to play piano at Carnegie Hall (Weill Hall). Recently she won first place in the MTAC Sonoma competition for level 7. She is also a prize winner of AAGDT competition. In her spare time she enjoys playing piano for the seniors at retirement homes, playing tennis, swimming, reading, and art. Brain Lin, age 10, is a 5th grader at Chadbourne Elementary school in Fremont. He currently studies Piano with Peyhawn Kuan. He is the 3rd place winner in the 2018 Pacific Musical Society Competition; Winner of the 2018 Fremont Symphony an Orchestra-Young Recitalist competition; 1st place winner at the 2018 USOMC Senior Level - Treasury of Baroque Composers ; 2nd place at the KAMSA piano competition in January. Brian loves spending time at senior nursing homes by regularly playing piano to the elderly. Apart from piano, Brian is very passionate about basketball. He also enjoys drawing, and cooking with his mom on his spare time. Jeston Lu, age 13, is a 7th grader in Horner Junior High School in Fremont. He has been learning piano since 5, and his current teacher is Peyhwan Kuan. In recent years, he won numerous awards in several piano competitions such as Marilyn Mindell (Junior) Competition, 2nd Place in Kamsa Competition (Junior-Piano), 2nd Place in Showcase Piano Solo (Junior) and Open Duet Romantic (Advanced) in USOMC, etc. He enjoys learning music, and loves chamber ensemble. He is a regular piano performer in senior centers. In his spare time, he loves drawing, improvising music, geography and hiking. Riku C. Sakai, age 13, is a 7th grader at JLS Middle School. He is currently studying with Dr. Axel Schmitt since 2017. Riku has been playing a piano for 6 years and 9 months. Riku received the 1st. place in 2018 USOMC with an additional Outstanding Gold Medalist Award, Silver Medal at 2016 Bay Area Music Association's US International Music Competition. Riku also played in an ensemble and won the first place in 2017 American ProtÃ©gÃ© Competition (including performing at Carnegie Hall), 2nd. place in 2017 USIMC, and the 3rd. place in 2017 USOMC. Riku also plays trumpet at his school Jazz Band A. While not playing piano or trumpet, Riku loves to play soccer at a competitive National Premier League. Yejin Song, 13, is from Saratoga, California and is an 8th grader at Harker Middle School. She currently studies piano under Hans Boepple. Yejin is the winner of the 2018 MTAC Regional Piano Solo Competition and also won first place at the 2017 Korea Times Youth Music Competition. Additionally, she was a prizewinner at the 2017 United States International Music Competition and the 2018 United States Open Music Competition. Aside from her piano studies, Yejin enjoys participating in her school's dance team and student council. Jonah Tan, 9, 4th grade at American Indian in Oakland. I have been learning to play piano since 5. I have participated 2016 and 2017 US Open Music Competition. In 2016's competition, I won one first place, two second places, two third places, and one fourth place. In 2017's competition, I won the third place for Showcase Solo which I tried first time. In addition, I won one second place, four third places, and two fourth places. I just passed CM level 4 audition this March. Supposedly to assist learning, I am training to play the violin. I hope to continue to learn about this art of playing piano for a long time. Sean Sun (12) student at JLS middle school, Palo Alto. He has been studying with Hang Li at the Pre-College division of the San Francisco Conservatory of Music. He has won the first place for International Music Competition Best Haydn Performance in the Great Composer Competition series, and the 3rd place for US Open Music Competition Showcase for Piano. His performance has been selected to the San Francisco Conservatory of Music pre-college youtube channel. Sean is actively working with local young chamber music groups. Aside from piano, Sean enjoys math, programming, reading, cooking, solving puzzles, playing clarinet, badminton, basketball. Celicia Thendean, age 10, is a fourth grader at Mohr Elementary School in Pleasanton, CA. She started learning piano at the age of 3 from her mom. When she was 5 years old, she started taking lesson from Prof. Anna Poklewski. Celicia is currently enrolled in San Francisco Conservatory of Music pre-college program and taking lesson from Machiko Kobialka. She has won numerous prizes from U.S. Open Music Competition in 2014 to 2017, including Best Outstanding Gold Medalist in 2014, She also got third, second, and Contemporary award in East Bay Music Competition in 2015 and 2017. Celicia won first prize in American Protege and performed at Carnegie Hall in Summer 2016. Her other achievements include Second place at USIMC in 2016 and Second Alternate at CAPMT Honor Competition in 2018. Besides music, Celicia enjoys reading, dancing, and math. Aaron Tu, age 11, is 6 grader at Lawson Middle school in Cupertino, his current teacher is Lena Grozman. Aaron has been studying Piano since age 6, he is a first prize winner and Chinese award winner at 2013 CMTANC INTERNATIONAL YOUTH MUSIC COMPETITION, group A. Aaron has won numerous prizes at USOMC competition in various categories. Aaron is 2nd place winner at 2018 CAPMT state Final honors competition group B. In his spare time, Aaron loves basketball, swimming and reading. Ryan Wang, is a 6th grader at Bullis Charter School in Los Altos. Ryan studies with Prof. Hans Boepple. Ryan was awarded Outstanding Gold Medalist and won 1st place in US Open Music Competition showcase piano solo, 2nd place in United States International Music Competition, 3rd place in San Jose International Piano Competition and he was 1st Alternate in the 2018 MTAC concerto competition. He also plays violin. Besides love of music, Ryan also enjoys math, and many kinds of sports. Jacob Winefeld (11) One of my favorite hobbies is playing piano. I have played it since I started kindergarten over 6 years ago. I like playing and listening to Chopin and Beethoven, and my favorite music is Tzvi Erez's transcription of Czardas by Monti. I applied for the Chopin competition because there is a chance I could win and I love winning J and also because, like I already told, I like Chopin's music. Other than music, I like playing ping pong, basketball, and solving interesting math brain teasers and puzzles. Leo Yoshida, 9 years old, is a Japanese native, and a 3rd grader at Foster City Elementary School. He has been studying piano since 5 years old. He is the finalist of his age category in the Japanese National Competition of 2017. His current teacher is Ms. Machiko Kobialka. Allyson Yu, 8 years old, has been studying piano for the past five years with her teacher Peyhwan Kuan. She has participated in piano audition for the Santa Clara Valley Chapter District II of the CAPMT. She has also performed in the CAPMT Northern Festival in 2017 and competed in 2017 US Open Music Duet (4th place). Besides music, she likes to read, draw, do gymnastics, play tennis and ski and swimming. She also loves to travel with her family. Brooke Zheng, a freshman at Mission San Jose High School, has been learning piano under the guidance of Ms. Rozina Tenenbaum for seven years. She loves to play piano and performs in the MSSL group and at school to let other people experience the music. Other than playing piano, Brooke also enjoys fencing, photography, and reading. Curtis Li: Etudes from Opus 25, No. 5 & 12. Catherine Huang: Nocturne in C Minor, Op. 48 No. 1. Jasleen Lu, 9, is a 4th grader in Weibel Elementary School in Fremont. Jasleen studies music with Peyhwan Kuan. In 2017, she received Honorable Mention in SF Chopin Competition, Young Artist Award (Piano) in USIMC, East Bay Piano Competition (Primary I), and 4th Place in Treasury of Romantic Composers (Intermediate) in USOMC. In her spare time, she loves reading, playing violin, swimming and playing tennis. Cecilia Zhuo, age of 10, is a 5th grader of Chinese Christian School in Alameda. Cecilia started private piano lessons at age 4 and began her formal piano training with the acclaimed pianist Robert Schwartz in 2012. She won the First Prize for the East Bay Piano Competition in 2015 and Honorable Mention in the 2017 San Jose International Piano Competition. Cecilia got selected to perform at the Junior Bach Music Festival in 2016 and 2017. Cecilia just passed CM level test for level 8 with the highest grade 5+, andd performed at the MTAC Annual Convention. Cecilia has performed at the MTAC-SF recitals and the MTAC-SF Music Festival many times. Cecilia loves listening to the classic music, drawing, and golfing in her leisure time. Xinran Shi, age 8, is a 3rd grader at Challenger School in San Jose. She started her piano lesson at age 4, and her current teacher is Lena Grozman. She won 2nd place at USOMC Showcase Solo, Treasury of Baroque Composers Intermediate and Treasury of Classical Composers Junior in 2017. Besides playing piano, she loves dancing, swimming, ice skating and reading. She also won several National Elite First prizes with her dance team. Stanley Du, age 9, is a 4th grader at Lincoln Elementary School in Cupertino. Stanley has been studying piano since age 5, and he is currently studying under Lena Grozman. He won honorable mention at the 2017 San Jose International piano competition in the Young Musician category. Stanley enjoys music and all kinds of sports. Jeston Lu, 12, a 7th grader in Horner Junior High School in Fremont. He studies music with Peyhwan Kuan. In 2017, he won 1st Place in East Bay Piano Competition (Primary II), 2nd Place in Young Artist Award (Piano) in USIMC, 2nd Place in Showcase Piano Solo Junior in USOMC, and Honorable Mention in SF Chopin Competition. He is a regular piano performer in senior centers. His hobbies are drawing, improvising music and playing tennis. Sarah Yuan was born in 2005. Starting piano at the age of seven, she first started taking lessons with Mrs. Sharon Linton and later with Mr. James Gardner. Now, Sarah is studying with Dr. Sharon Mann in Dr. Mann's private studio. In 2015, Sarah won second place in the East Bay Music Festival. She has also been chosen as the first alternate in the Music Teachers Association of California for the Northern Region in 2016. In 2015, 2016, and 2017, Sarah was selected to perform at the Junior Bach Festival; she also won first prize at the Sturm-Page Piano Scholarship Competition this year too. The summer after, she participated in Crowden's Summer Chamber Music Workshop. When she is not practicing piano, Sarah enjoys reading and baking. Elisabeth Floyd is 11 years old and student of Frank Levy. She won 1st place at the 2016 The Korea Times Youth Music Competition. She won 2nd place at the 2017 US Open Music Competition showcase solo. She is the 3rd place winner at the 2015 US international Music Competition. She is the 3rd place winner at the 2017 SF Chopin competition. She loves golfing and swimming in her free time. Riley Kong currently studies with Lena Grozman. To add on the previous winning awards, in 2017 Riley won first prize in CAI Virtuoso Competition II with invitation to perform at Carnegie Hall; 2nd place in CAPMT Contemporary for state final and 3rd in Concerto for Northern California; 1st, 2nd, 3rd prize in various categories in GCC and ENKOR intl music competition. Riley also enjoys reading, competing in math, science, and robotics. Emma Lee, age 12, currently a seventh grader at Graham Middle School in Mountain View, began piano at the age of 4. Her parents first introduced her to the music world hoping that classical music could become her lifelong friend. Ever since her first lesson with teacher Doris Lin, she not only loved music, but she also devoted herself to personalizing it, weaving individual sentiments into her music, her own Fantasia of imagination. Emma continued her piano studying since 2012 under Dr. Anna Semyanovsky. Under teacher Anna's mentorship, Emma's unique style flourished. In addition to winning numerous awards from USOMC, she also performed in the Junior Bach Festival, has won 1st Alternate in MTAC, and was one of the winners in 2017 Palo Alto Philharmonic Concerto Movement Competition. Curtis Li, an 8th grader from Pleasanton, is under the tutelage of Mrs. Peyhwan Kuan, and has been studying under her for 6 years. He has been a recipient of many awards at competitions like the East Bay competition and the US Open Competition. He also received a diploma from the ABRSM with a distinction last year. Aside from piano, he also plays the flute and enjoys doing math. Irene Geng is a 10th grader at Irvington High School in Fremont. She has been studying piano with Ms. Rozina Tenenbaum for 8 years. She enjoys music and shares her love of music with people by performing with MSSL (Music Students Service League, Southern Alameda County) and the Rising Stars group at local senior centers. She is the secretary of her high school's Science Bowl and membership secretary for MSSL. Irene also participates in math competitions, and likes ballet and playing with her dog, Belle. Joshua Schiller is an eighth grader at Helios School in Sunnyvale, California. He started playing piano at the age of four, and began studying with Erna Gulabyan in 2014. Under her tutelage he has won various competitions: MTAC solo, Marilyn Mindell, US Open piano solo categories, and the AFAF piano competition that gave him opportunity to perform in Weill Recital Hall in New York. Angelina Wong: Nocturne in C-Sharp Minor, Op. posth. Étude in A Minor, Op. 25, No. 11 "Winter Wind"
Munan Cheng age 9, is a fifth grader. She is studying with Professor Hans Boepple and previously studied with Ms. Lena Grozman and Dr. Natalya Lundtvedt. She started playing piano at four. She has been placed in numbers of competitions include Chopin SF, LA Musian Competition, USOMC, USIMC, SJIPC, CAPMT state final. She is playing flute in school band. Munan loves reading and connects stories to her music. She also enjoys swimming and drawing. Jacob Rockower, age 8, is a 3rd grader at Nueva School. Jacob has been studying piano since 3, and his current teacher is Lena Grozman. Jacob is a winner of the 21st Annual San Francisco Chopin Competition for Young Pianists, 2016 American Fine Arts Festival Competition, 2015 Golden Key International Musical Festival, and 2015 American Protégé International Piano and Strings Competition, and has performed at Carnegie Hall. Jacob also won numerous awards including 1st place at 2015 CAPMT State Final Contemporary A, 2nd place at 2015 USOMC Open Solo 3C and 1st place at 2014 USOMC Treasury of Russian Junior. Jacob loves swimming and golf. Emily Tsai, age 9, is a 4th grader at Eaton Elementary School and currently studies piano with Lena Grozman. She won 1st place at 2014 USOMC Treasury of Contemporary, third place at 2015 USOMC Showcase Solo, USIMC by CMTANC in 2016, and received honorable mention in the 21st SF Chopin Competition. Emily enjoys reading, drawing and ice skating. Her favorite subject in school is language arts and her favorite composers are Mozart and Chopin. Angelina Wong, age 8, started her piano learning when she was four. Currently studying with Professor Hans Boepple, Angelina is always drawn to beautiful sound. She loves Mozart, Beethoven, and Chopin. In her own words, "They sound so different but equally beautiful!" Among her favorite items: books, music, food, and pretty stickers, Angelina places music above all. She also plays violin and loves swimming. Jarett Xu, 9 years old, is a scholarship student at the San Francisco Conservatory of Music, Pre-College Division, where he has been studying piano with Meikui Matsushima since 2011. He is currently a 3rd grader at Town School for Boys. Besides playing piano, he is interested in athletics like karate, swimming and basketball. He also like reading and building Legos whenever has free time. Anna Guan is a 13-year-old 8th grader in San Ramon. She has been studying piano with Ms. Liza Yasnogorodsky since April, 2009. Anna was selected to perform at various festivals and concerts sponsored by CHOPINSF, MTACSF, EBMF, and American Protege. Anna has won numerous awards including third place in the American Protege International Piano and Strings Competition, second place in the Chopin Competition of San Francisco, second place in the Showcase piano Solo in the USOMC, and first place in the MTACSF Competition. Her hobbies include reading, writing and dance. 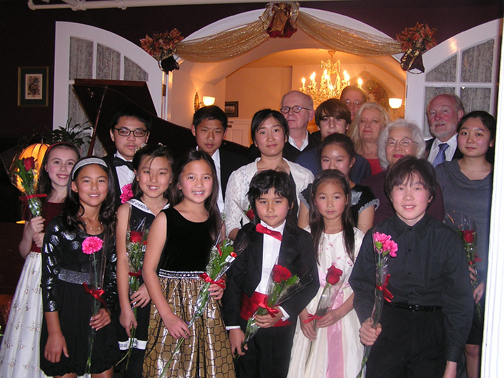 Kelvin Jiang is a 12-year-old scholarship student at the San Francisco Conservatory of Music for the Pre-College division, studying under Meikui Matsushima. Performing in the 2015 Pre-College Showcase Concert and Sarah Chang Piano-Violin Duo Masterclass, Kelvin was also selected to perform at the 2014 Junior Bach Festival and received 2nd place at the 21st San Francisco Chopin Competition. Aside from piano, Kelvin enjoys math, Rubik's Cubes, playing baseball, and basketball. He was also selected to represent team USA in the World Youth Chess Championship in Slovenia. Mikan Tsuchida, 12, started piano from 3, violin 6,and trumpet 11. She studied piano with Ms. Mie Shibasaki, Mr. Yasuo Sakamoto, and Ms. Anna Poklewski for the past 2 years. She is the 1st prize winner of the SF Chopin competition 2016, Yamaha Young Pianist Concert 2011, and the winner of numerous other competitions. She was also rewarded the bronze prize from the president for her volunteer service as a pianist. Mikan's interest has been expanding to composing and modern music as well. Ethan Yu is a 6th grader at Mission Valley Elementary School in Fremont. He started piano at age 6 and is currently studying with Prof. Anna Poklewski. Ethan has won numerous awards in 2016 including first prize winner in Korea Times Music Competition, third place in US International Music Competition, honorable mention in East Bay Music Festival and forth in USOMC. Ethan said, when I set off on stage, I like to express my emotions and feelings, just like Chopin and Liszt. Other than piano, Ethan enjoys acting, reading world history, golf, and basketball. Claire Cheng is a junior at Irvington High School and studies piano with Katherine Lee. She has placed first in both 2015 and 2016 East Bay Piano Competitions, was chosen as second alternate in the 2015 MTAC Solo Competition, won second in the 2015 United States International Music Competition hosted by CMTANC, and placed first at the 2016 SF Chopin Competition for Young Pianists. In addition to piano, Claire plays flute and has been accepted into both the All-Northern (NCBA) and All-State (CBDA) honor bands. She is also the assistant drum major of her school marching band and recently won first place at a NCBA-hosted competition. In her free time, Claire enjoys listening to music, reading, and watching Studio Ghibli films. Joshua Kushner was born in the year of 2002. He is attending 8th Grade at Bret Harte Middle School in San Jose Unified District. He started piano lesson at the age of six. Joshua studied piano with Mrs Celia Mendez from October 2009 to June, 2013. Since September 2013, he has been studying piano with professor Namik Sultanov. In 2012 he won the second place in CMTANC International Youth Music Competition. He participated in the US Open Music Competition and earned the first place in playing music from Romantic period in Senior group in 2015 and the second place in advanced group in 2016. He also likes computer pragramming and hang out with friends playing video games. Karina Tseng, a student of Steinway Artist Sujeeva Hapugalle, is a freshman at Carlmont High School, Belmont. Karina has been a top prize winner in 2016 competitions such as the SF Chopin Competition, the Marilyn Mindell Piano Competition, and the MTAC Solo Competition. She is privileged to be a part of this year's Young Chambers Musicians Program. Christopher Richardson was accepted to Juilliard and Johns Hopkins/Peabody under Leon Fleisher. He is a student of UC Berkeley and studies the piano with Mack McCray. Christopher was the featured soloist with many orchestras, including the Minnesota Orchestra. He was one of the top prizewinners in numerous national and international piano competitions. He was a recipient of the Chopin National Foundation Scholarship, and won first prize and the Chopin prize at the National MTNA Competition. He appeared on NPR's "From the Top", TV program PIE on KCTS 9, and King FM 98.1. He also gave a speech and performance at the TEDxYouth@Redmond Conference. Katherine Vari: Nocturen in C Minor, Op. posth. Ray Chen: Waltz in E Minor, Op. posth. Melody Gawon Choi: Polonaise in B-flat Major, Op. posth. Cami Akioka has been studying piano with Olya Katsman for the past 5 years. She was selected as a winner in the SF Chopin Competition in 2012. In February, she won 1st place in the State CAPMT Concerto Competition held in Los Angeles. Among her awards are first prize in the Solo Competition at the California Association of Professional Music Teachers (CAPMT) State convention, 1st alternate at the Northern California Honors Auditions for CAPMT and first place in the 2012 Music Teachers Association of California (MTAC) State Piano Solo Competition. Cami also enjoys performing chamber music and is currently a member of the Trio Volare Piano Trio with the Young Chamber Musicians. Ray Chen, age 10, is a student of Peyhwan Kuan. He has won numerous awards at US Open Music Competition, Junior Bach and East Bay Foundation Piano Competition. Besides being the first place winner of 2015 San Francisco Chopin Competition for Young Pianist, he is a gold medalist of Seattle International Piano Competition. Melody Gawon Choi, age 12, is a 7th grader who attends Union Middle School in San Jose. She started learning piano at the age of four, and is currently studying with Dr. Hyun Ju Sung since 2010. In 2015, she won third place for the San Francisco Chopin Competition, and she also won fourth place in the USOMC Open Solo category. In 2014, Melody won third place in the USOMC Impressionist Category Senior Division. She is an active participant for both MTNA Festival recitals and MTAC Student recitals every semester. Melody enjoys playing the violin as well as the piano. She is the Principal of violin 2 in the CYS Associate Orchestra. Currently, Melody serves as the accompanist for her school choir. In fourth grade, she was the Secretary of the student council, and in fifth grade, she was the President. In her spare time Melody loves to play badminton or crochet. Anna Guan is a 12-year-old 7th grader at Pine valley Middle School in San Ramon. She has been studying piano with Ms. Liza Yasnogorodsky since April, 2009. Anna was selected to perform at various festivals and concerts mainly sponsored by MTACSF, EBMF and American Protege. Anna has won numerous awards including third place in the American Protege international piano and strings competition, second place in the Chopin Competition of San Francisco, second place in the Showcase Piano Solo in the USOMC, first place in the MTACSF Competition. Her hobbies include reading, writing and dance. Leo Jergovic is a 7th-grade student at JLS Middle School, Palo Alto. He studies piano with Dr. William Wellborn at SFCM. He participated in several competitions and was most recently 1st place winner at both the 2015 SF Chopin Competition for Young Pianists and the CAPMT State Contemporary Music Festival in 2015. In 2013 Leo won 2nd place in International Russian Music Piano Competition. Leo enjoys acting, water polo and making friends. Mia Kao, 10 years old, is a 5-grade student at St. Andrew Episcopal School in Saratoga. She started playing piano at age 4 under Mrs. Ellen Sargisian at Lena Grozman Piano School. In 2012, Mia participated in the United State Open Music Competition and was awarded the 1st and 3rd place in her categories. In 2013, at age 7, she played her first Chopin piece, Waltz in A minor at the CMTANC International Youth Music Competition and was awarded the honorable mention. Besides piano, Mia also enjoys playing violin, reading and swimming. Alex Lin, age 9, a 4th grader at Stratford School Los Gatos Campus. Alex started piano lessons at age 5 with Ms. Mary Kramskoy. He is currently studying under Ms. Evgeniya Armishev. Besides piano, Alex plays league ice hockey and enjoys tennis and swimming. Andrew Lin, sophomore at Lynbrook High School, studies with Dr. William Wellborn. He received several awards including CMTANC and Russian Competition. He was selected to perform in Junior Bach Festival and with ECYS. Andrew also plays violin and recently performed at Carnegie Hall as a winner of the American Fine Arts Festival. His hobbies include chess, math, and landscape photography. Andrew Semenza, a 10th grader at The Harker School, is a student of Frank Levy. He has received several gold medals at the USOMC, won honorable mentions from the Marilyn Mindell piano competition, and a first place in the San Francisco Chopin Competition. He has participated in the Colburn Academy summer piano festival in 2012 and 2014, and he traveled to China in 2015 for the Beijing International Music Festival and Academy where he received in honorable mention in the festival's competition. Andrew is also a percussionist and pianist for the Harker Upper School orchestra. Katharine Vari (9) is a 5th grade student at the Bel Aire Elementary school in Tiburon. She joined SFCM in 2013 and is a student of Meikui Matushima. She enjoys reading, soccer, tennis and learning other languages such as Mandarin and Spanish. Katharine has a vivid imagination and loves any form of creative activity. She is also a member of her school Math club, Science Seminars and enjoys her role as a Math Tutor. The 2015 Chopin Competition was her first competitive experience, and she is excited to be a part of the Holiday Concert. Leo Jergovic: Polonaise in A-flat Major, Op. posth. Anna Guan: Nocturne in C-sharp Minor, Op. posth. Spencer Cha is a 10-year-old who has been taking lessons with Lena Grozman for the past three years. He won first place in the First Age Category earlier this year at the 19th Annual San Francisco Chopin Competition. He was also first place alternate in the 2013 CAPMT Contemporary Piano Competition. He previously took lessons with Maria Setiawan-Gore at the Northern California School of Music, where he placed 1st in both Groups A (age 5) and B (age 7). He enjoys soccer, golf, tennis, and skiing. Fiona Tsang, age 9, is a 4th grader at Milpitas Christian School. She has been playing piano since age five, and currently studying with Peyhwan Kuan. Fiona won 3rd place at 2014 USOMC in both Treasury of Russian Junior Category and Instrumental Solo Junior Category. Most recently, she won 3rd place in the 19th SF Chopin Competition for Young Pianists Category I. Besides piano, Fiona enjoys playing cello, reading, writing, drawing, hiking, travelling, and playing tennis. Kelvin Jiang is a 5th grader at Palo Verde Elementary in Palo Alto. He has been studying piano with Meikui Matsushima since February 2012. He plays many sports such as baseball, golf, soccer and basketball. He used to be an active chess player and was invited to the World Youth Chess Championship 2012 in Slovenia. He enjoys solving Rubik's Cubes up to 5x5. He was selected for this year's Junior Bach Festival, and got honorable mention for the Chopin Competition. Catherine Huang, age 12, is a seventh grader at Miller Middle School in San Jose. She is currently studying piano with Prof. Hans Boepple. Catherine has won a number of competitions, including the 1st place at the 2014 San Francisco Chopin Competition, 1st place at the 2013 MTAC State Concerto Competition, and 3rd place at the 2012 Pacific Musical Society Competition and 2011 SF Chopin Competition. Aside from piano, Catherine likes playing flute in the school band, dance, and math. Anna Guan is 11 years old and started piano in 2009. 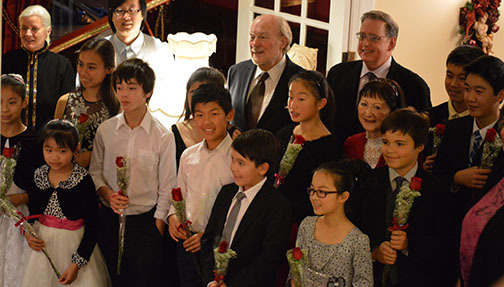 Anna was the 2nd prize winner of the Second Age Category in SF Chopin competition 2014. She won 3rd place of Young Musicians Category in the American Protege International Piano & Strings Competition 2014, and was invited to perform in Carnegie Hall. She has won 2nd and 3rd place in the Showcase Piano Solo Junior and Elementary Category at the USOMC 2014, 2013 & 2012; First place winner in the MTAC-SF piano competition 2011; gold winners in the BAMA competitions 2012-2013. Anna has participated in numerous recitals and festivals sponsored by MTAC-SF and BAMA mainly including the First Latin America/Spanish Music Festival Gala 2013, and the Russian Music Festival 2012. Joshua Kushner was born on January 21st, 2002. He is attending 7th grade at Bret Harte Middle School in San Jose Unifiied District. He started piano lesson in October, 2007. Joshua studied piano with Mrs Celia Mendez from October 2009 to June, 2013. Since September 2013, he has been studying piano with profesor Namik Sultanov. In 2012 he won the second place in CMTANC International Youth Music Competition. Joshua has also performed in recitals sponsored by MTAC, CAPMT, and SJIPC. Leo Jergovic is a 6th grade student at JLS, Palo Alto. He enjoys studying piano with Dr. William Wellborn at the San Francisco Conservatory of Music Preparatory Division. Leo studies voice with Christine Abraham, sings with Cantabile choir and is involved in musical theater. 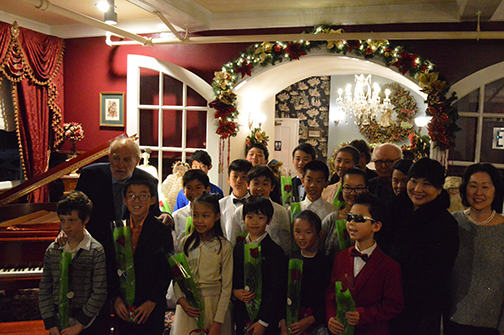 In 2013, Leo was a second prize winner in the International Russian Music Piano Competition, a first prize winner in the SFBAC NATS Singing Festival and received Achievement Award for Musicianship level 2 at SFCM. At age 7, he received honorable mention in the San Francisco Chopin Competition for Young Pianists. Leo loves reading, water-polo, traveling. Angela Tsang, 11, is a 6th grader at Milpitas Christian School. She has been playing piano since age five and currently studying with Peyhwan Kuan. Angela was the first place winner of the 2012 US Beacon-Stanislaus International Piano Competition, 2013 CAPMT Honors Auditions District II and 2014 USOMC-Treasury of Popular Favorites. She has won numerous awards including Sylvia M. Ghiglieri Piano Competition, USOMC-Showcase, the CAPMT Honors Audition State Competition, the 18th SF Chopin Competition, and the 19th SF Chopin Competition. Besides piano, Angela enjoys playing violin, reading, math, hiking, traveling, and playing tennis. Amanda Mac is a student of Dr. Jed Galant. Having started her piano studies at the age of seven, she has enjoyed the wonders of classical music for eight years. Amanda has participated in many music festivals and competitions where she received awards. In fact, she recently earned the top prize in the 19th Annual San Francisco Chopin Competition. Her favorite composers include Chopin, Bach, Beethoven, Prokofiev, and Ravel. During her rare free time, Amanda enjoys reading mystery novels, listening to classical music, and writing. Academically, her interests lie in the fields of mathematics and chemistry. Erin Chen has been studying piano for ten years at the Gingis Academy of Music under Professor Nataly Gingis. Erin has won many awards; the State Winner in 2010 CAMPT State Bartok Competition, 1st Alternate in the 2009 MTAC Piano Solo Competition, First Place in 2012 CMTANC International Youth Competition, and Third Place in 2011 and Second Place in 2014 San Francisco Chopin Competition. She also won First Place of the American ProtÃ©gÃ© International Piano and Strings Competition and First Place of the AADGT International Young Gifted Musicians Festival in 2013. Additionally, Erin has been invited to play in Carnegie Hall twice in 2013. Erin is currently a 10th grader in Monta Vista High School. She enjoys being one of the editors of the school yearbook team and is an avid volunteer in her free time. Kyle Fang, 15, studies piano with Dr. William Wellborn at the SFCM Preparatory Division. In summer 2013, he was awarded second place in the concerto competition of the Austrian International Piano Seminar. In 2014, Kyle received Honorable Mention from the Fremont Symphony Young Artist Concerto Competition. He has been selected to perform in Junior Bach Festival concerts and was awarded third place in the 2014 San Francisco Chopin Competition. Aside from spending time at the keyboard, Kyle plays competitive soccer. Ning Zhou won first prize in the Jiangxi first teenage Piano Competition at age eleven, and entered the prestigious Shanghai Conservatory of music at age seventeen. During studies there, he performed with Shanghai Philharmonic Orchestra and took second prize in the 2010 Gulangyu national piano competition. Additional awards have come in the Shenzhen International Piano Concerto Competition (Final Prize, 2014), Southern Highlands International Piano Competition (Best Chopin Prize, 2011), the San Marino International Piano Competition and the Paderewsi Piano Competition. Mr. Zhou was also a participant in the 13th quadrennial Van Cliburn International Piano Competition in Ft. Worth, Texas, and has performed in Italy and Germany. Mr. Zhou is a 2009 graduate of the Shanghai Conservatory of Music and has recently begun Master of Music degree studies under the tutelage of Professor Mack McCray at the San Francisco Conservatory of Music. Music Author and biographer Olin Chism submitted that Ning Zhou have been "a highly musical person, a master not only of technique but of interpretation." Miyabi Kadowaki started playing piano at age five and has studied with piano teachers Ruzanna Faramazyan and Lena Grozman. Miyabi has won numerous awards in both the solo and duet division in the US Open Music Competition in 2011 and 2012 and won first place in the Aloha International Piano Competition in 2013. She was selected to perform at a historical event in Niigata, Japan, and in the Junior Bach festival in 2013. Besides playing the piano, she enjoys reading, drawing, singing and math as well as being a competitive swimmer at PASA- DKS site. Khoi Le is 10 years old. He attends Sycamore Valley Elementary in Danville. Besides playing piano, Khoi’s favorite hobbies include composing and improvising music. Khoi’s compositions are mostly influenced by his favorite composers including Chopin,Tchaikovsky, Mozart, Beethoven, Haydn, and Bach, as he feels connected to their music. Khoi currently takes lessons at the SF Conservatory with Arkadi Serper. During his free time, he enjoys Taekwondo and playing with his younger brother, Ben, who is 7 years old. 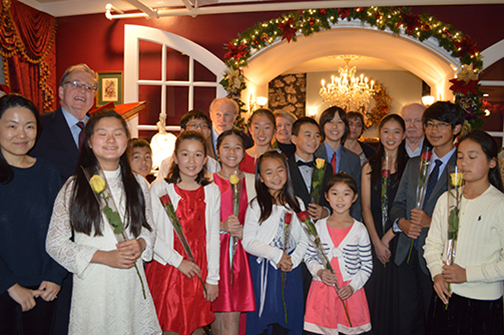 Jessica Li, age 10, is a 5th grader at Murdock-Portal Elementary in Cupertino school district, has been studying and playing piano since age 4, currently with Professor Hans Boepple. Jessica has won numerous awards mainly including the First place in 2011 CMTANC Youth Music Competition, the Second place in 2012 US Open Music Competition, the Second place in 2012 International Russian Music Piano Competition, the First place in 2012 Aloha International Piano Competition, the third place in 2013 MTAC Piano Concerto Competition, the Gold Medal and Best Performance of a Work by J.S. Bach in 2013 Seattle International Piano Competition. Jessica enjoys ballet, reading, drawing, math and swimming as well. Hana Mizuta, 15, is a sophomore at Homestead High School. She has been playing piano since the age of 5, and is currently studying with Heidi Hau and Erna Gulabyan at the San Francisco Conservatory of Music. Hana received first prize in the 2012 Menuhin-Dowling Music Competition, first prize in the 2010 Marilyn Mindell Piano Competition, and second prize in the 2012 Pacific Musical Society Competition. This past summer, she studied with John O’Conor at the Aspen Music Festival. Dominic Pang, 10 years old is a student of William Wellborn at the San Francisco Conservatory of Music. He performed at various festivals sponsored by American Protégé, American Fine Arts Festival, American Association for the Development of the Gifted and Talented, Classical Music Masters Music Festival and Junior Bach Music Festival. He is proud to be a Webelos Scout of Pack 386 in Folsom, California. In his free time, he enjoys playing cello, bicycling, swimming, reading about history, making Lego creations and playing with his cat Mocha. Shiyi Andy Sheng, 15, is studying music with Mrs. Anna Polonsky. Most recently, he won 3rd place in the San Francisco Chopin Competition and 2nd place in US Open Music Competition’s Showcase Solo Intermediate Category. In previous years, he has won 3rd prize & Honorable mention at International Russian Music Competition and 1st, 2nd, and 3rd prizes at U.S Open Music Competition. In 2012, he has performed piano concerto with Vienna Symphony Orchestra in Vienna and 5 piano and organ solo concerts internationally in the Bay Area, Ebenfurth, Austria & Zychlin, Poland. He is an active member of Evergreen Ensemble and the vice president of Evergreen Valley Youth Orchestra (EVYO), serves as music director and conductor. Chikako Shimada, 9years old and a 4th grader at Francis Scott Key Elementary School in San Francisco. She studies with Machiko Kobialka at San Francisco Conservatory of Music,and she participates in their Chamber Music Program.She was selected to perform in 2013 Junior Bach Festival. She was the second -alternate winner in the 2013 MTAC Piano Solo Competition, and she was the first prize winner in 2013CAPMT district? HonorsAudition. Chikako enjoys swimming,reading and drawing. Angela Tsang, 10, started learning piano at age five, and gave her 1st piano solo recital at age six. She is currently studying under Ms. Peyhwan Kuan. Angela was the first place winner of the US Beacon-Stanislaus International Piano Competition, 2012-2013 CAPMT Honors Auditions for District II; she received the Honorable Mentions at the State Final of the CAPMT Honors Auditions and the SF Chopin Competition for Young Pianist. Angela also received awards from Sylvia M. Ghiglieri Piano Competition and USOMC-showcase piano solo. Karina Tseng, age 11, is a 6th grader at Ralston Middle School. She has studied piano with Sujeeva Hapugalle for over five years. Karina was a 1st and 2nd place winner at the 2013 U.S. Open Music Competition; her performance at the winners' concert earned her an Outstanding Gold Medalist Award. She won 2nd place at the 2013 San Francisco Chopin competition, and 2nd runner up at the 2013 Menulin/Dowling Competition. Outside of piano, she enjoys rollerblading, reading, and violin. Chenchen Zhang graduated from the Shanghai Conservatory of Music majoring in piano performance. She was born in Yantai, Shandong in 1989 and began studying piano at the age of 5. In 1997,she won the second prize in Shandong Teenager Piano Competition, and in the following year she was the first person at Shandong, who qualified as a finalist in ‘Xing hai’, China's teenager piano competition, which is one of the highest-level competitions in China. In 2000,she gained admission to Music Middle School affiliated with the Shanghai Conservatory of Music with the highest scores, studying with Professor Shao Dan. During this time she was selected as the youngest student in the Shanghai Perlman master summer classes in 2002, by praise from many professors. She also won the first prize of the 65th Steinway teenager piano competition (East China area). She has received the scholarship several times, and has also been selected with great honors for the student union president in high school. In 2006, she held two solo concerts in Shanghai Baoshan District Place, and in the next year, she took part in several chamber music concerts in Shanghai Symphony’s Hall. Now she studies with Professor Mack McCray in San Francisco Conservatory of Music. Cami Akioka is a 7th grader at Jordan Middle School in Palo Alto. She began studying piano at the age of seven and studies with Olya Katsman. This past year, Cami won first place in the MTAC Piano Solo Competition, Division I, at the state convention held in San Diego. She was the winner of her age division in the Menuhin-Dowling Young Artist Competition and was selected to perform at the Junior Bach Festival in Berkeley. Before moving to Northern California, she was a branch and regional winner for the Southern California Junior Bach Festival and a scholarship winner in the CAPMT Sonata Competition. In 2008, as part of the Los Angeles Philharmonic Music Fair, Cami was selected as a Junior Rising Star by the Peninsula Committee. She has won both first and second place in the junior division of the MTAC Scholarship Competition. Along with her love of music, Cami is an avid soccer player and enjoys art, animals and reading. Josephine Chan is 9 years old and is studying piano with Meikui Matsushima at San Francisco Conservatory of Music. She was selected to perform in 2011 Junior Bach Festival. She has participated in master classes with Mack McCray and Corey McVicar. Josephine is a 4th grader at Stratford School and enjoys classical music, reading, art and badminton. Bryan Chang, age 11, is a 6th grader at JLS Middle School in Palo Alto. Bryan began studying the piano at age four with Heidi Hau, a faculty member of the San Francisco Conservatory of Music. Since 2007, he began his piano training with acclaimed pianist Robert Schwartz. Bryan showed his interests in composition at a fairly young age. He also had his composition study at the SFCM in the Prep Division. In his spare time, he enjoys reading, playing chess, and creating LEGO robotics. Heather Chang, 14, is currently a 8th grader at JLS Middle School in Palo Alto, and a scholarship student of Mack McCray in the Preparatory Division of the San Francisco Conservatory of Music. She has won prizes in the Pacific Music Society Competition, the San Francisco Chopin Competition, and the Kawai Piano Competition, Taiwan Regional. Heather enjoys listening to music, reading, and swimming in her spare time. Josephine Chou is a 4th grader at Argonaut Elementary school in Saratoga. She is currently studying with Professor Hans Boepple at Santa Clara University. Since beginning piano lessons at age four, Josephine has won numerous honors including highest prize awarded in the San Francisco Chopin competition, first alternate in the MTAC Concerto Competition, the MTAC Piano Solo Competition and the CAPMT Honors Audition. She will be performing the Haydn Concerto in D Major with Winchester Symphony in December at West Valley College (Saratoga) and Trinity Cathedral (San Jose). Josephine enjoys reading, drawing, rollerblading and ice skating, but she enjoys playing piano the most, and Chopin is one of her favorite composers. Wilson Chen, age nine, is a third grader at Milpitas Christian School. He has been studying with Peyhwan Kuan for a little over three years. At the 2012 US Open Music Competition, Wilson is the third place winner in the category of the the Treasury of Classical-Senior; he also was the third place winner of the US Open Music Competition for Treasury of Baroque-Intermediate in 2011. Wilson was the District II winner for the CAPMT Honors Audition in 2010 for the age group 7 and under. Besides piano, he enjoys playing cello, reading, drawing,and swimming. Clara Galant, 8, is a 3rd grader at Bunker Elementary School in Newark. She has been studying piano with her mother, Olya Katsman, for the past three years. Recently, she performed in the Jr. Bach Festival in Berkeley, and was awarded both second prize and the contemporary music award in the East Bay Music Festival. In September she gave her first solo recital. Clara is also very active in sports, swimming for Calphin in Union City, running, and as a member of the Gold Star rhythmic gymnastics team in Mountain View. Misha Galant, 15, is a freshman at Newark Memorial High School in Newark. He began piano lessons at the age of six with his mother and current teacher, Olya Katsman. Among his accomplishments are first prizes in the Menuhin-Dowling Young Pianist’s Competition, the CAPMT Bartok and Contemporary Music competition, the CAPMT Honors Auditions and northern division concerto competition, and the East Bay Music Festival. In 2010, he was the state winner in the MTAC concerto competition and, as the winner of the Oakland East Bay Symphony concerto competition, he performed the Chopin Concerto no. 1 with the orchestra two years ago. Misha has performed in the Junior Bach Festival in Berkeley and in masterclasses with Gilbert Kalish, Mack McCray, Paul Hersh, Ann Schein and Robert Scwartz. He has also performed for William Bolcom, Leon Fleisher, and Stephen Prutsman and is currently preparing for his third solo recital in December. Misha is indebted to Sharon Mann of the San Francisco Conservatory for her invaluable and inspirational coaching. Andrew Lin is a 7th grader at Miller Middle School in San Jose. He currently studies with Dr. William Wellborn. Andrew received awards from USOMC Showcase Solo, CAPMT Honors Auditions, CMTANC Youth Music Competition, USOMC Showcase Concerto, and MTAC Concerto Competition. He was selected to perform in Junior Bach Festival and was chosen to perform with El Camino Youth Symphony as a piano soloist. Andrew enjoys playing chess, reading, swimming, hiking, and playing video games in his free time. Chloe Ma is a twelve-year old, 7th grade homeschooler. She started piano at age 4 and her current piano teacher is Mr. John McCarthy. She has won prizes at US Open Music Competition, East Bay Piano Competition, Pacific Musical Society, Bradshaw & Buono Piano Competition and participated at Junior Bach Festival 2009 and 2011 in Berkeley. She's also the winner in the Oakland East Bay Symphony Concerto Competition in 2011. She also participated in the documentary film “Miracle In a Box” by John Korty. Chloe enjoys readings, learning Chinese Kung Fu, and studying nature. Hanson Tam is a sophomore at Menlo School. He studies with Dr. William Wellborn at SFCM Preparatory Division. He won top prizes in the SF Chopin Competition, Pacific Musical Society Competition, International Russian Music Piano Competition, and Marilyn Mindell Piano Competition. He has performed in Carnegie Hall, the Junior Bach Festival, Steinway Society Bay Area Concert, and Franz Liszt Gala Concert. Hanson appeared on the NPR program "From the Top" with the Mondo Trio. He is a recipient of the 2012 National Chopin Foundation Scholarship. Nigel Zhang, age fifteen, is a sophomore at Lowell High School in San Francisco. He started playing piano at age six and is currently a student of Dr. William Wellborn at the SFCM Prep Division. In 2010 and 2011, he won second place in the Early Advanced category in the MTAC SF Branch Competition. Nigel performed in many recitals including MTAC Branch Recitals and MTAC State Conventions. 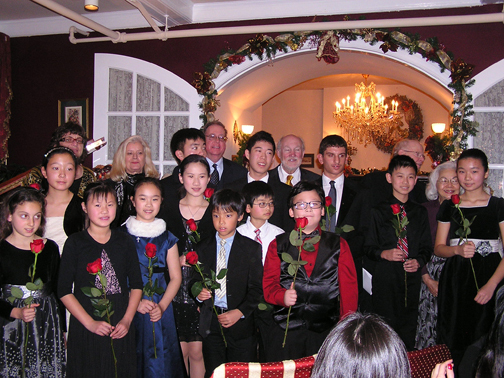 In January 2011, Nigel participated in the Lang Lang101 Pianist Workshop in San Francisco. He has also attended and performed at the International Piano Seminar in Ebenfurth, Austria last year. In his spare time, Nigel enjoys biking, swimming, and doing competitive math. Weian Wang: Étude Op. 25 No. 11 "Winter Wind"
Bryan Chang, age 10, is a 5th grader at El Carmelo elementary in Palo Alto. Bryan began studying the piano at age four with Heidi Hau, a faculty member of the San Francisco Conservatory of Music Prep Division. Since 2007, he began his piano training with the acclaimed pianist Robert Schwartz. Bryan showed his interests in composition at a fairly young age. He also studies composition with arkadi serper at the San Francisco Conservatory of Music in the Preparatory Division. This April, he won the first place at the San Francisco MTAC competition in the Intermediate category. In his spare time, he enjoys reading, playing chess, and creating LEGO robotics. Heather Hsun Chang, 7th grade at JLS Middle School in Palo Alto, currently is studying music from Professor Mack McCray at the San Francisco Conservatory of Music’s Preparatory Division. Heather started her music career since 2003 at the age of 5, before SFCM, she learned from Concert Pianist Chiao-Han Liao and has won numerous awards. Heather also learned music composition and had her pieces announced 2010. Besides music, she also shows her talent in art, and her work was exhibited in the art gallery since 2007. Erin Chen, age 12, has been studying piano for six years at the Gingis Academy of Music under Professor Nataly Gingis. She has won many awards ; the State Winner in 2010 CAMPT State Bartok and Contemporary Music Competition, the 1st Alternate Winner in the 2009 MTAC Piano Solo Competition, the Third Place Winner in 2011 San Francisco Chopin Competition, and 5 gold medals in USOMC. Erin also enjoys being a pianist for her school plays, and is one of the editors of her school yearbook. Catherine Huang, age 9, is a girl who loves music. She started learning piano at the age of four, currently studying with Mrs. Lena Grozman. Catherine has won a number of competitions since the age of 5, including recently the 3rd place at the 2011 San Francisco Chopin Competition in the 9&under age category. She goes to Dilworth Elementary and is in fourth grade. She enjoys reading, resolving math and science problems, dancing ballet, and swimming. Leo Jergovic, Leo is a 8 year old 3rd grader at Fairmeadow Elementary in Palo Alto . Leo started learning piano in spring 2009. He joined the San Francisco Conservatory of Music’s Preparation Division in fall 2010 and enjoys studying piano with Mrs. Meikui Matsushima. Leo loves music, acting, swimming, drawing, reading, skiing and traveling. He enjoys his family and friends and loves making new friends. Robert J. Pearce, A grand finalist in KDFC radio's Classical Star Search, RJ Pearce (16) appears in chamber music and solo performances in San Francisco and all over Marin county. He is a four time winner of the Marin Music Chest Scholarship Award, a two time soloist for the bay area Junior Bach Festival and a two time first place winner of the MTAC junior piano competition. When not playing classical RJ can be seen as the keyboardist for the popular band "Crunchy Frog." Jerry Peng, Jerry is a 5th grader and currently studying piano with Prof. Hans Boepple. He previously studied with Mrs. Amy Huang. Jerry has won numerous piano solo awards at USOMC and CMTANC between 2008 and 2010. Jerry was 1st alternative CAPMT regional Bartok Contemporary Music Festival. Recently Jerry received honorable mention in the northern regional at 2011 MTAC Piano Concerto Competitions. Jerry also is a violinist in school orchestra and pianist in school Jazz band. Weian Wang, 16, has been studying piano since the age of 6 and is currently a student of Dr. William Wellborn. She made her Carnegie Hall debut at the age of 12 as a first prize winner of the Bradshaw and Buono International Piano Competition and performed in the Weill Hall, subsequently returning in 2009, having been selected to perform in the American Fine Arts Festival. Aside from piano, Weian is captain of her school Lynbrook High School’s Mock Trial team and an active member of her school’s Future Business Leaders of America club, French Honor Society, and Math Honor Society. In her spare time, she likes to compete in Sudoku competitions and play Tetris. Chloe Wen, age nine, has always enjoyed music . She considers the piano “a way to express true feelings with the depth of the sound world of the piano ”. Since the beginning of her studies of piano, she has always enjoyed playing and listening to Chopin’s music. She says that “his music speaks to her; the beautiful strands of music- delicate, passionate and epic that Chopin has taken much time to compose are breath-taking.” During her budding music career, Chloe has won two awards at United States Open Music Competition, performed with Lang Lang during SF 101 Pianists, and participated in other various concerts including charity performances.She has been a student of Steinway Artist , Sujeeva Hapugalle. Besides piano, Chloe enjoys other activities including playing violin, tennis, and roller-skating. Catherine Xu is a sophomore at the Lynbrook High School in San Jose. She began her piano studies at age six and is a current student of John McCarthy. In the past several years Catherine has won numerous awards including the third place winner of the 2008 13th San Francisco Chopin Competition, the winner of the 2009 Marilyn Mindell Competition of the Peninsula Symphony, the alternate winner of the 2010 MTNA’s Junior Piano Performance Competition in California, and the first prize winner of the 2011 16th San Francisco Chopin Competition. Erika Shen - Erika Shen,started playing piano since five and half and currently with Ms. Zita Sandor. Erika won many awards at USOMC in 2009 and won honorable mention for MTAC Solo Division I in 2010. Erika has been an avid skier and snowboarder since five and enjoys reading,gymnastics, ballet and swimming. Lindsay Tao - Lindsay Tao is a fifth grader at Eaton Elementary School in Cupertino. She has been playing the piano since first grade and is currently studying with Professor Hans Boepple. Besides playing the piano, Lindsay is a Girl Scout, loves playing soccer and enjoys reading Greek Mythology. Ray Hua Wu - Ray Hua Wu began playing piano in 2001, and is currently a student of Dr. Jed Galant. Ray Hua has won several awards in piano performance, and the 2010 San Francisco Chopin Competition is his first where he won first prize in the senior division. He also enjoys composing music as well as studying mathematics, chemistry, and natural sciences. Rachel Breen - Rachel Breen started playing piano at 5 years of age. She currently studies piano with Dr. Sharon Mann at the San Francisco Conservatory of Music, and is determined to be a concert pianist by the time she's 18. Her interests include playing piano, studying piano music, reading books, and listening to music. Jamie Cleron - Jamie began playing the piano at the age of three, and is currently a student of Mrs. Christie Skousen. Jamie received first place in the 2008 USOMC Open Solo 5A competition, and third place in Open Solo 5B. In addition to piano, she enjoys reading, soccer, track and tennis. Alexandra Cong - Starting piano at the age of six, Alexandra has garnered numerous awards and honors in piano competitions throughout the Bay Area, including the MTAC (2008 & 2004), Menuhin-Dowling (2008), and Sylvia M. Ghiglieri (2009) competitions. Alexandra has also put her artistry to serve the community at large, having helped to raise $4000 for impoverished children in Iraq. Rebecca Hu - Rebecca Hu, currently a sophomore at Aragon High School, began her pianistic career with the Choupaks at the age of four. Since then, she has been awarded in noted competitions such as USOMC and CMTANC. Rebecca also enjoys dancing, painting, modeling, playing volleyball, playing the violin, and relishing delicious steak. Hugo Kitano - Hugo Kitano, age 14, is a freshman at Lowell High School. He currently studies with Dr. Wellborn at SFCM. He has won many awards at local and international competitions, and his performances include performing Beethoven Third Concerto with the Palo Alto Philharmonic as well as in venues at Carnegie Hall, in Tokyo, Austria, Hungary and England. Anwen Lin - Anwen is eight years old and started home schooling this fall as a 3rd grader. She began studying piano at age three with her loving teacher Robin Wachsberg, who fostered her passion for music. At age six, Anwen started cello lessons with master teacher, Irene Sharp. She inspired Anwen to be the best musician she can be. Besides music, Anwen enjoys tennis, skiing, running, art, reading & poetry writing. Dustin Ping - Dustin Ping is in the seventh grade. He has participated in many piano competitions: 2005 CMTANC Piano Competition - Group B, second prize; 2009 MTAC Concerto Competition - Division 1, first prize; 2009 14th Annual SF Chopin Competition for Young Pianists - Category 2, first prize; 2009 MTAC State Convention Concerto Competition - Division 1; second prize. Christopher Richardson 11 year old is currently a student of Robert Schwartz. He won 1st prize at the 2008 SF Chopin. 2009 he won 2nd prize in the Bradshaw and Buono international piano competition, and has been invited to play in NY this December, won 1st prize at the East Bay competition, 1st place in all three categories he entered in the "Kids Play The Darndest Things" and was chosen the best performer at the winners’ concert. 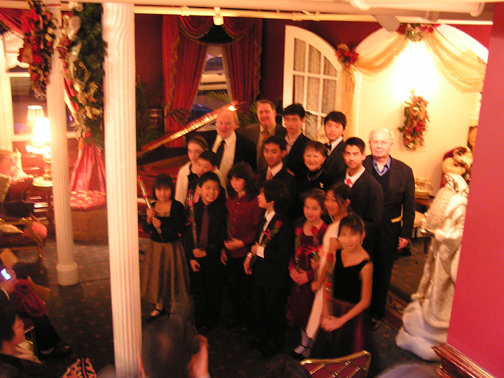 He participated in a master class at the Portland Piano International Festival 09. Gabriel Schillinger-Hyman - Gabriel is 11 years old and is studying piano at the San Francisco Conservatory of Music with Sima Kouyoumdjian. Gabriel also plays clarinet, comes from a family of musicians, and has perfect pitch. He is a 6th grader at The San Francisco School, where his academics are thriving. Gabriel is bilingual in Spanish/English, enjoys playing soccer and junior varsity basketball with his friends, and just won an award for cross-country running. He is especially drawn to the music of Chopin and Khatchaturian. Rhed Shi Rhed Shi began learning the piano at the age of six and currently studies with Dr. Namik Sultanov. He was the 2008-2009 recipient of the National Chopin Scholarship. During the summer of 2008, he participated in the Interharmony International Music Festival in Birklehof, Germany. He received an Honorable Mention in the MTAC Competition in 2009. He has also received the Gold Medal Level of the Presidential Volunteer Service Award. Academically, he is an honor student and was the Valedictorian of Quimby Oak Middle School. NiuNiu Teo - NiuNiu is a sophomore at Pinewood School in Los Altos . She studies piano with Mr. Yoshi Nagai in SFCM. In the past, she has won awards from competitions from Pacific Music Society, and has performed at the Carnegie Hall (Weill) with the AFAF. Besides studying piano, NiuNiu also plays the violin at CYS. Ashley Wen - Ashley Wen, age 10 attending Sandpiper Elementary as a 5th grader, has a strong musical sense and a love for Chopin. Ashley has been playing piano since age 5, and is currently studying with Steinway Artist, Sujeeva Hapugalle. Besides piano, Ashley loves ice skating, skiing, swimming, tennis and playing violin. Quinn Wu - Quinn began his piano studies at age five and is currently a student of Dr. William Wellborn at the San Francisco Conservatory of Music. 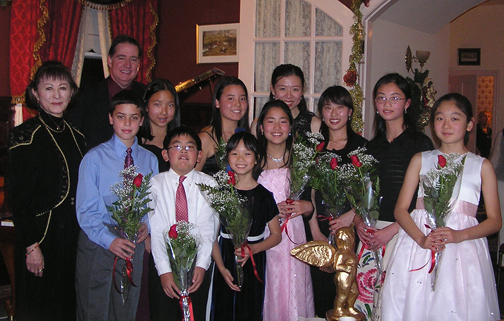 Before SFCM, Quinn studied with the concert pianist, Aileen Chanco. Quinn also plays the violin for the El Camino Youth Symphony under Dr. Camilla Kolchinsky. This year, he received Honorable Mention in the East Bay Music Festival. Besides music, he won the 2nd place at 2007 International Mental Arithmetic Invitation Competition and the gold awards at 2007 and 2008 World City Cup – Abacus, Mental Arithmetic & Mathematics competition. Quinn enjoys reading, playing tennis, and traveling in his free time. Sunday, December 7, 2008, 4:00 p.m.
Helen Xu : Waltz in E Minor, Op. Post. Eytan Schillinger-Hyman : Waltz in E Major, Op. Post. Sean Yeo : Nocturne in C minor, Op. Post. Rachel Breen - Rachel began studying the piano at age four for a talent show at The Academy, the school she still attends in Berkeley, California. Her teacher was her father, Michael, who does not play piano. Her musical home schooling ended after the late musical director, Ken Durling, who introduced her to her teacher, Sharon Mann, noticed her at a Junior Bach performance. She has participated in that festival again, as well as in Junior Bach outreach program concerts. After Mr. Durling’s death in April 2007, she was chosen to play at a memorial for him. Rachel is a scholarship student at the San Francisco Conservatory of Music, studying chamber music and musicianship with Machiko Kobialka, Andrew Luchansky, and Richard Roper. She has also performed in leading parts of Gilbert & Sullivan operettas at The Academy, under the direction of Pamela Alexander. Rachel enjoys swimming, reading, and most of all, her friends. She was also a prizewinner in the 2008 Yehudi Menuhin competition. Jessica Kur - Jessica is a fourth grader at the Francis Scott Key Elementary School in San Francisco. She started her piano lessons with Christie Skousen at the age of five. Besides piano, she has been studying ballet and tap for several years, and also recently started violin lessons at school. Ryan Lee - Ryan Lee, fourteen, is a home-schooled eighth grader with yearly SAT scores averaging 98 percentile. His favorite subjects for this academic year are Advanced Algebra and Physical Science. 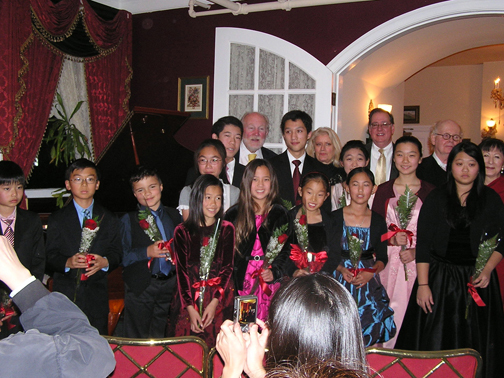 At the recent 2008 USOMC piano competition, Ryan won the Gold Medal for the Showcase Solo Intermediate Category. As a First Place Winner, he was selected to perform in the Gold Medalist Showcase Concert in Oakland, California earlier this year. Occasionally, Ryan performs as a piano accompanist for violinists’ recitals and piano concertos. Besides the piano, Ryan also plays the violin. Having been with a string ensemble for four years, Ryan has performed as a first violinist as well as a soloist in benefit concerts throughout the San Francisco Bay Area and Southern California. Vien Nguyen - Vien is a sophomore at the Menlo School in Atherton and currently studies music with Dr. William Wellborn at the San Francisco Conservatory of Music. In the past few years, Vien has won several awards, including first prize at the 2006 CAPMT State Bartók and Contemporary Music competition and the 2006 MTAC competition, and second prize in the 2007 Annual San Francisco Chopin Competition for Young Pianists. He was a scholarship recipient of the 2008 National Chopin Foundation and a two-time participant of the Liszt Piano Academy and Festival in Hungary and Austria. Vien also plays the violin for the El Camino Youth Symphony Orchestra under Dr. Camilla Kolchinsky and toured Finland, Estonia, and Russia last summer. Besides English, Vien is already fluent in French, Spanish, and Vietnamese. He also enjoys playing tennis for his Menlo School team, and holds a second-degree black belt in Taekwondo. Christopher Richardson - Christopher Richardson is nine years old and is currently in the fourth grade at the Montair Elementary School in Danville, California. He began piano lessons in 2005 and now studies with Dr. William Wellborn at the San Francisco Conservatory of Music. He has also taken master classes with Dr. Robert Schwartz. His hobbies are playing with his many pets, hiking, reading, and playing video games with his brother. This summer, he will perform in the honors recitals at the MTAC state convention in Riverside. Eytan Schillinger-Hyman - Eytan Schillinger-Hyman, nine, is studying piano at the San Francisco Conservatory of Music with Sima Kouyoumdjian. His favorite composer is Chopin. Eytan also plays the flute. His grandfather is a conductor, and his grandmother is a concert pianist. Eytan enjoys playing classical, jazz, and rock n’ roll music. Elaine Shen - Elaine is currently a fifth grader at The Nueva School in Hillsborough. She started playing the piano with Helen Wong when she was six. Elaine has won many awards throughout the years such as the Bartók and Contemporary Music Festival followed by the Bartók State Finals. Elaine has also won the U.S. Open Music Competition and Kids Play the Darndest Things. She enjoys figure skating, skiing, and riding the Ripstik. Rhed Shi - Rhed is a freshman at the Evergreen Valley High School in San Jose. He started learning piano at age six. He currently studies with Dr. Namik Sultanov and owes much of his pianistic abilities to him as well as Janna Abramiya, his previous teacher. Over the years, he has won numerous competitions, including the Doubles Grand Champion Prize for the Youth Music Competition at age eight and first prize in the USOMC. 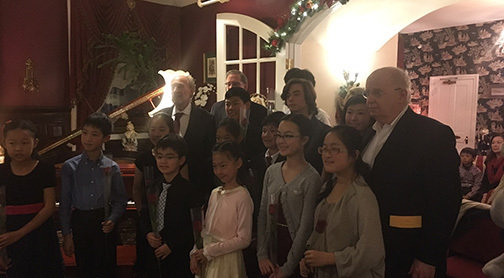 Rhed has been actively participating in the International Russian Music Piano Competition’s semiannual recitals and was recently granted the Chopin Foundation Scholarship. This summer, Rhed will also attend the Interharmony International Music Festival held in Birklehof, Germany. Last year, Rhed graduated from the Quimby Oak Middle School as the Valedictorian of the Class of 2007. He enjoys playing soccer and was a part of the school soccer team. His other hobbies are chess, debating, and skiing. He wishes to become a virtuoso and delight audiences around the world. Hanson Tam - Hanson began his piano studies at age five and is currently a student of Dr. William Wellborn. In 2006, he won first alternate in the Bartók and Contemporary Music Festival. This year, he won second prize in the MTAC-SF Piano Competition and Honorable Mention in the Fremont Symphony Orchestra Young Artist Concerto Competition. He was also a winner in the San Mateo County Fair Piano Competition. Hanson attends West Hillsborough Elementary School. He is the California Champion of the Math Fax Competition four Grades 4 and 5 in 2007 and 2008 respectively. He plays the flute in his school band. Hanson enjoys reading, swimming, skiing, and biking in his free time. 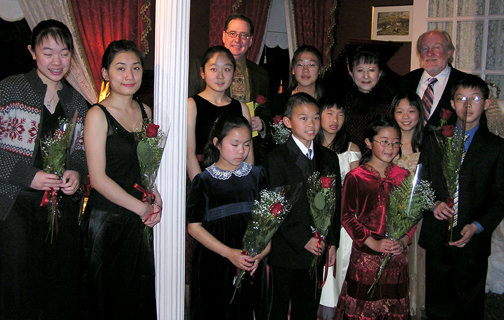 Catherine Xu - Catherine Xu, twelve, began her piano studies at age six and is a student of John McCarthy. She completed the Advanced Level of the MTAC's Certificate of Merit at age 10. She has played various pieces by many different composers, and is especially drawn to the music of Chopin. In addition to the piano, she also enjoys ice-skating, dancing, and playing a traditional Chinese instrument – Gu Zheng. She is in the sixth grade at the Miller Middle School in the Cupertino School District. Helen Xu - Helen is nine years old and a third grade student of the Regnart Elementary School in Cupertino. She started playing the piano when she was just five years old. She studied with Mr. Alex Spivak from February 2004 to October 2005 and has been studying with Ms. Anna Poklewski since October 2006. Besides the piano, she likes reading, science, some sports, and playing with her younger bother, Alex. Andrew Yang - Andrew is currently a sophomore at the Crystal Springs Uplands School. He has been playing the piano for ten years, and has been a student of Dr. William Wellborn since 2006. His favorite subjects at school are English and Art. Andrew also plays violin and has been in PYO since 2000. Andrew enjoys playing sports, especially badminton and basketball. He is currently playing number one singles for his school’s varsity badminton team. In his free time, he enjoys playing sports with his friends, drawing, and reading. He is also a big fan of the Golden State Warriors. Sean Yeo - Sean is eight years old and is home schooled. He is studying piano with Ms. Meikui Matsushima. Sean is also studying the violin with Ms. Bettina Mussemeli. He likes fishing and swimming. Sunday, December 9, 2007, 4:00 p.m.
Hugo Kitano: Waltz in E Minor, Op. Posth. Ariel Yu - My name is Ariel Yu. I am nine years old. I am a fourth grader in St. Monica School. I study piano at San Francisco Conservatory of Music. My piano teacher is Meikui Matsushima. I started taking piano lessons when I was five years old. Besides piano, I enjoy playing soccer and running at track meets. I take Karate lessons too. I received honorable mention at last year's Chopin Competition. Luke Chui - Luke started piano in 2005 with Ms. Lena Grozman. He is currently taking piano lessons with Mrs. Christie Skouson at Perry Music Center. He likes Lego, Math, and various sports. Joshua Chiang - Joshua Chiang was born in the spring of 1998. At a very young age, he began to show interest toward music through music listening and playing on our family piano by his self. At age five, he started to receive piano lessons from Mrs. Christie Skousen. In 2004, Joshua received second place at the US Open Solo 1B competition. In 2006, Joshua received first alternate at the MTAC solo competition. In 2007, Joshua received third place at the US Open Treasury of Romantic Senior competition. In 2007, Joshua received Honorable Mention in the MTAC solo competition. Besides music and playing piano, Joshua also loves to play tennis and soccer. Jillian Kim - Jillian Kim is a 13 years old native of San Francisco. She is a scholarship student of the San Francisco Conservatory of Music Preparatory Division under Meikui Matsushima's direction since she was six years old. She participated at the Zephyr International Music Festival in Courmayeur, Italy at the age of eight and then at twelve. Jillian has been giving solo recitals since the age of 10. She received first place for Pacific Musical Society's Junior Piano Division in 2006 and performed in the Junior Bach Festival in 2007. Jillian has participated in master classes by Mack McCray, Bonnie Hampton. Jillian is in eighth grade in St. Gabriel School in San Francisco. Hugo Kitano - Hugo Kitano is in the sixth grade at the San Francisco Day School. He began his piano studies at the age of six and is currently a student of Dr. William Wellborn at the San Francisco Conservatory of Music. In 2006, he won first prize in the Intermediate category of the MTAC-SF competition, received honorable mention of the Second Age Category at San Francisco Chopin Competition for Young Pianists, and received first alternate at the Bartok and Contemporary Music Festival. In March 2007, he performed at the American Liszt Society Festival. Hugo also plays chamber music with the Triwizard Trio at the San Francisco Conservatory of Music. In addition to the piano, Hugo enjoys playing the saxophone with his school ensemble and the Japan Town band. Hugo is a nationally ranked chess player and the 2007 regional geography bee winner who competed at the state competition. Caroline Wong - Caroline Wong has played the piano for eight years, and currently studies the piano at the San Francisco Conservatory of Music with Meikui Matsushima. She was selected to perform in the Junior Bach Festival in 2006 and 2007. Caroline lives in San Francisco and goes to school at Lick-Wilmerding High School. Vien Nguyen - Vien is a freshman at the Menlo School in Atherton. He has studied piano with Dr. William Wellborn for the last three years and attended the Franz Liszt Summer Piano Academy and Festival in Hungary. His accomplishments include first prizes in CAPMT State Bartok and Contemporary Music and MTAC competitions. He also studies violin with Ms. Tarley and is currently a member of the ECYS Senior Symphony. He is fluent in four languages and hopes to acquire German and Russian in the future. He holds a second degree back belt in Taekwondo and is in the Menlo School 's tennis team. He enjoys cooking, performing music, and traveling. John Provine - John Provine was born in the United Kingdom and studied violin and piano from an early age. In 2005 he graduated from Harvard University with a Bachelors degree in Computer Science. As a student he gave regular performances and studied chamber music under the instruction of Robert Levin, Daniel Stepner, and Yehudi Wyner. John currently resides in Menlo Park and studies piano with Yoshikazu Nagai at the San Francisco Conservatory of Music. Since arriving in the Bay Area he has become very active in the chamber music scene and has had coachings and masterclasses with several pianists including Kumaran Arul, George Barth, Malcolm Bilson, Hans Boepple, Maria Ezerova, Paul Hersh, Gabriel Kwok, Jamie Parker, Stephen Prutsman, Santiago Rodriguez, and Robert Schwartz. On top of his musical endeavors, John is a full-time software engineer at Google where he works on search algorithms. Sunday, December 3, 2006, 4:00 p.m.
Jillian Kim: Polonaise in G-sharp Minor, Op. Posth. Ashley Hsu: Ballade in F Minor, Op. 52. Ashley Hsu, age 15 is currently a student of Professor Hans Boepple. Ashley was the grand prize winner of the 2006 MTAC Piano Concerto Competition playing Beethoven's Emperor Concerto. She was also a scholarship winner of the National Chopin Foundation, a winner of the Palo Alto Philharmonic Concerto Competition, the El Camino Youth Symphony Concerto Competition and the Mozart Festival Piano Competition. Ashley was also awarded second prize in the California Youth Symphony Concerto Competition as well as the CAPMT Paino Concerto Competition. She has been selected to perform in the Junior Bach Festival many times. Presently, she studies composition with Dr. Pamela Quist, and was a past piano student of Jed Galant. Hilda Huang, age 10, is a student of John McCarthy in the Preparatory Division at the San Francisco Conservatory of Music. She was one of only four students in the world selected to attend "Music @ Menlo last season. In addition to the piano, Hilda is a serious student of the Harpsichord,and a student of Corey Jameson. Hilda is in the 6th grade at Jordan Middle School in Palo Alto. Christine Kim, age 15, is a student of John McCarthy in the Preparatory Division at the San Francisco Conservatory of Music. 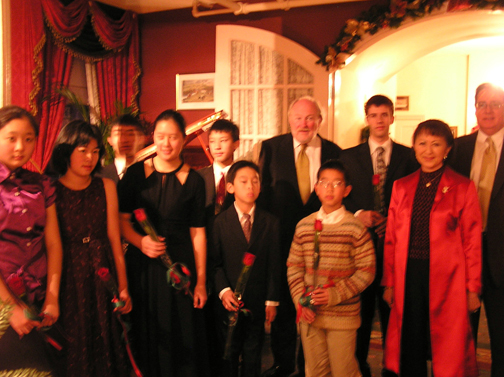 Christine has received the 2006 Grand Prize in the Korea Times Piano Competition and first prize in the 2006 Chinese Music Teacher's Associaiton Competition. She enjoys cross country running and is a sophmore at Gunn High School in Palo Alto. Jillian Kim Jillian is 12 years old and is a native of San Francisco. She is currently a scholarship student at the Preparatory Division of The San Francisco Conservatory of Music. Jillian is a student of Mekui Matsushima. Reading and swimming are her passion besides Music. Jillian is a competitive swimmer and is a member of The Fog City Hammerheads Swim Team. Andrea Lim, age 10 is a student of John McCarthy and attends Carey School in San Mateo as a fifth grader. She has recieved first prize in the San Mateo County Fair Competition and likes to read mystery books. Hugo Kitano Hugo is in the sixth grade at the San Francisco Day School. He began his piano studies at the age of six and is currently a student of Dr. William Wellborn at San Francisco Conservatory of Music. In 2006, he won first prize in the Intermediate category of the MTAC-SF competition, and in June he was selected to perform in Dennis Alexander's master class at the annual MTAC state convention. In addition to the piano, Hugo enjoys playing the saxophone with his school ensemble and the Japan Town house band. Hugo is a nationally ranked chess player at the age 11 and under category. Caroline Wu I just turned 9 in May. I'm in 3rd grade. I started playing piano in kindergarten, at The Cannon Music Studio, when I was 6. I started playing piano with Mrs. Skousen. I won 2nd place in the U.S. Open, and the score I got for RACE level two was 93 - first class of honors with distinction. I had my first solo recital on April 25, 2004. I also take swimming class at the Freemont High and ballet class in Dance Academy. An native of Taiwan, 18-year-old pianist Lo-An Lin studies with Mr. Yoshikazu Nagai at the San Francisco Conservatory of Music. Lo-An has been a prizewinner and finalist of many competitions, including the New York Piano Competition, Kosciusko Foundation Chopin Piano Competition, and Lennox International concerto competition. She has received several first prizes including YAMAHA Taiwan national piano competition(2003), Hsing Tein Temple Taiwan national piano competition(2001), Viardo International Piano Competition(2005), and MTNA National Piano Competition(2006). She also won the second prize at the Missouri Southern International Piano Competition(2006). Lo-An has performed with the Interlochen Arts Academy Orchestra in 2005 and with Gerard Schwarz at EMF in 2006. Sunday, December 4, 2005, 4:00 p.m.
Ido Akov: Waltz in A Minor Op. 34, No. 2. Catherine Fu: Nocturne in B Major, Op. 62, No 1. Ido Akov, seventh grader at Brandeis Hillel Day School in San Francisco, started piano when he was 9 years old with Marina Bartolin and Hanah Shalgi in Israel before moving to San Francisco in 2004. Currently he studies piano with Meikui Matsushima and composition with Alexis Alrich-Howe at the San Francisco Conservatory of Music, and has been chosen to perform on the Conservatory's Farewell Concert on April 23, 2006 before the move to the new building on Oak Street. Catherine Fu, winner of San Francisco Chopin Competition for Young Pianist (1st place in 2004, 2nd Age Group); 1st places at East Bay Musical Festivals in 2002 and 2005; Winner of Menuhin-Dowling Young Musician Competition in 2005. She studies piano with Mrs. Ming-Huei Wu. In her leisure, she likes reading. Daniel Hsu is 8. He started piano at age 6 and currently is a student of Olya Katsman. In 2005, Daniel has received many first place awards: San Francisco Chopin Competition (6/05); Solo Competition in the USOMC (2/05); Junior Bach Festival (3/05); CAPMT Bartok and Contemporary Music Competition (11/05); Mozart Festival Piano Concerto (11/05) and will perform Piano Concerto No. 17 in January 2006. Daniel wants to become a professional concert pianist when he grows up. Jillian Kim is 11 years old and is a native of San Francisco. She is currently a scholarship student at the Preparatory Division of The San Francisco Conservatory of Music. Jillian is a student of Mekui Matsushima. Reading and swimming are her passion besides Music. Jillian is a competitive swimmer and is a member of The Fog City Hammerheads Swim Team. Andrea Lim is 9 years old and is a forth-grader at the Carey School in San Mateo. Andrea started playing the piano when she was four years old and has been a participant in Peninsula Grace Notes concerts for the last two years. She currently studies piano with Dorian Ho. She is also a member of the Otter Swim Club in San Mateo. Andrea loves to read classic books as well as Archie comics. When she grows up, Andrea would like to be a 2nd grade teacher. Mayumi Tsuchida, age 14, is a student of John McCarthy in the Preparatory Division at the San Francisco Conservatory. She has studied previously with Machiko Kobialka. 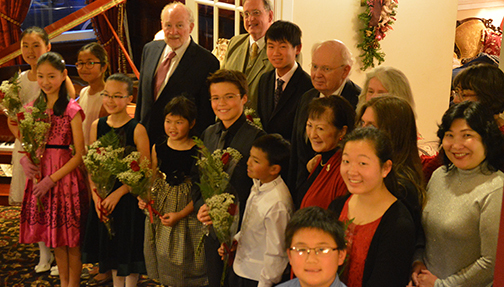 Mayumi has received prizes in the Jr. Baldwin State Piano competition and in Japan. She is a freshman at San Domenico School. Rieko Tsuchida, age 10, is a student of John McCarthy in the Preparatory Division at the San Francisco Conservatory of Music. She has studied previously with Machiko Kobialka. Rieko has received first prize in the 2005 MTAC Solo Competition at the state level. She is in the 6th grade at San Domenico. School. Born in Guangzhou, China, Jielin (Carol) Hou began piano lessons at the age of four and graduated from The Middle School of Guangzhou Xinghai Conservatory of Music with high distinction in 1998. After that she studied with Nancy Loo Tsang at the Hong Kong Academy for Performing Arts, receiving her Bachelor of Music degree with First-Class Honors in 2004. Most currently she is studying for the Master Degree in Piano Performance with Mack McCray at the San Francisco Conservatory of Music as the recipient of the Janet Rose and Walter L. Rose Piano Scholarship. Jielin has been performing frequently in Hong Kong and Macau both as a soloist and chamber music player. Ruishi Chen was born in Guangzhou, China, where she studied with Meide Huang and then Professor Dan Chen, winning numerous awards. In 2001 Ruishi entered Interrlochen Arts Academy in Michigan, studying with Yoshikazu Nagai. At the Eastern Music Festival she won the concerto competition and performed the Ravel Piano Concerto in G with the student orchestra. Having received the Fine Art in Piano Award at her graduation from Interlochen, Ruishi is currently an undergraduate piano student at the San Francisco Conservatory of Music where she studies with Mack McCray.